With technology and the web playing such a key role in the function of human society, how might this affect humans as a species? Far into the future, with the help of advanced technology, will people evolve or transcend into amorphous beings that travel and communicate through electrical lines and electronic devices? What will happen to the earth when we become so attached to technology that we abandon the environment that allows us to exist? 2018 American Frame “3rd Annual Employee Art Show” Maumee, Ohio. USA. This small metal sculpture represents chronic illness and more specifically the malfunction of the body. The human body is complex and has many interworking mechanisms that keep everything functioning as intended. If one part of this network fails to do its job properly, it could cause a domino effect, creating an array of symptoms. I have transferred inkjet prints to the surfaces of each one of the four metal chambers. These prints depict a microscopic view of skin cells. In a healthy patient, the cells would be tight-knit and orderly. However, in this depiction, the skin cells are scattered and located farther apart than they should be. This is representative of a connective tissue disorder which can effect the function of organs, joints, and muscles. 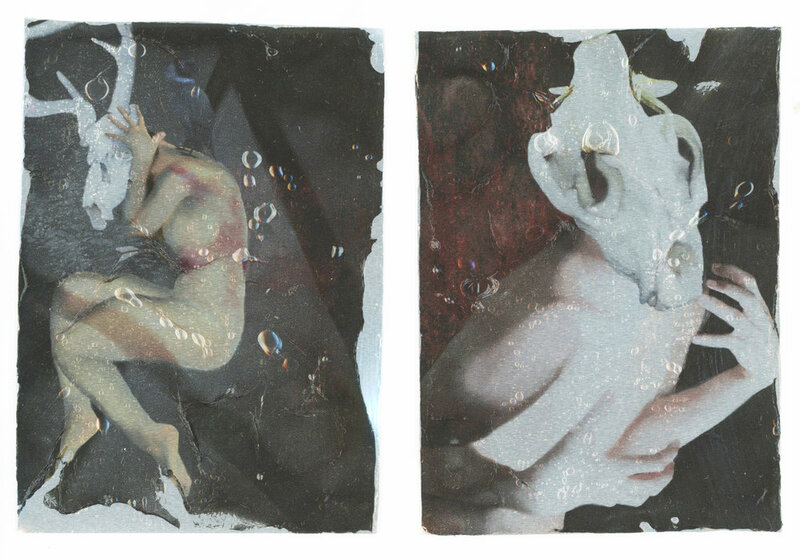 This Diptych represents pain and emotions caused by Chronic Illness. This is a digital image that has been transferred to metal, exaggerating the image's surrealism. The supersauce transfer gives the images slight imperfections which only adds to the imperfections and pain of illness. The specular highlights of the aluminum add to the haunting feeling that I wanted to deliver to the viewer. These images are small which invites the viewer to look closely. This allows the viewer to find the symbolism placed throughout these two images. 2018 20 North Gallery “ARToledo 2018: Chrysalis” Toledo, Ohio. USA. This body of work was heavily inspired by a black out poem I created. Using slit scanning methods, I went outside and explored symbols I found in my environment that could relate directly to my poem. After I digitally manipulated my photos, I transferred the images to sheets of aluminum. Referring to the environment I was in, I gathered driftwood from Lake Erie and suspended my images from them. The title of this body of work, Permanent, comes directly from a line in the poem and is a nod towards my attempt to freeze these moments in time and space. 2016 Coburn Art Gallery “Ohio New Photography Exhibition” Ashland, Ohio. USA. This series was created from the theme of Hacked. Although there are multiple meanings to the word, these images focus on coping and managing pain. The process used for this series of images is slit scanning. This process is important to the images aesthetics as well as its symbolic meaning. 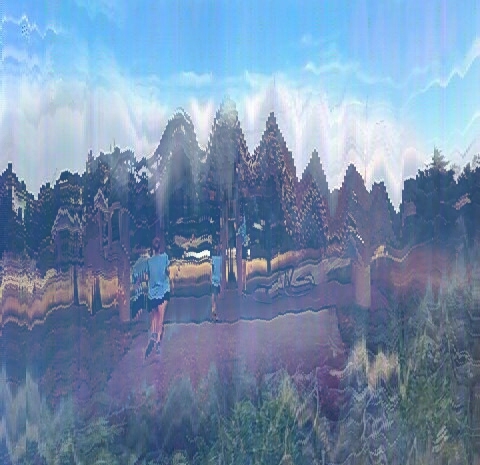 Slit Scanning alters an image in the sense that it is taking multiple images through time and combines them into one final image. This symbolizes the uncertainty and unpredictability of pain and the ability to cope with it. There are many layers and details that invite the viewer in to take a closer look. Images of flowers can be seen in two of the images which represent searching for and finding hope. 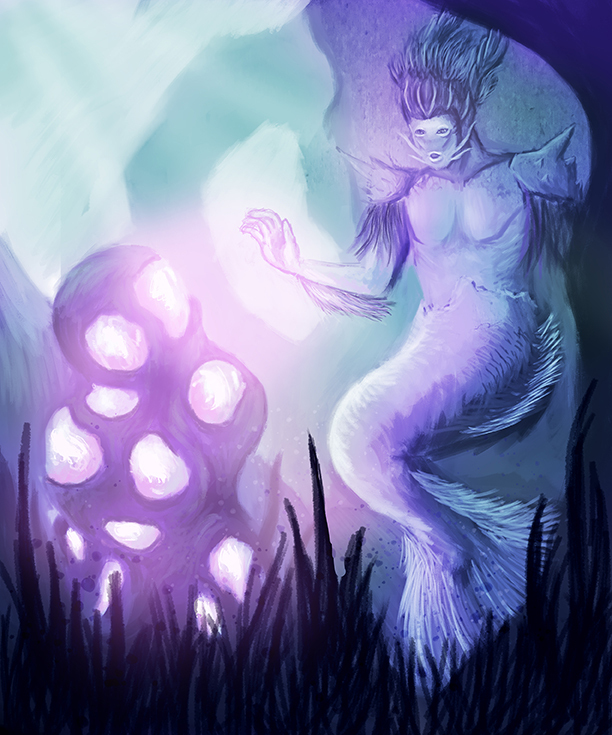 This merman has discovered a glowing land formation deep under the sea. Using blue, purple and pink hues, this image explores the idea of wonder and mystery in a world me might not understand. 2018 Los Angeles Center for Digital Art “Snap to Grid” Los Angeles, California. USA. My family discovered a notebook filled with letters written to my great grandpa Lester Hall from my great grandma Sophia Hall during WWII. Among this notebook, was their war rations booklet and other military documents. This diptych plays a role in documenting history as well as telling the story of my great-grandparents. This is a story that many other families may have experienced during that time in history. Using Slit Scanning as a form of photography, I combined these photos with scans of the found documents. This tells the story of my great grandmother’s experience at home, caring for the family as well as my great grandfather’s experience as a soldier in the U.S. Army. He fell very ill at one point during the war, and among these found documents is a poem by “Author Unknown” that urged him to get better. This project was extremely important because my great-grandfather did not talk much about what he went through as a soldier in WWII so much of the story has been lost. This notebook serves as a sort of time capsule that history cannot erase. I wish to preserve it further as digital artwork. 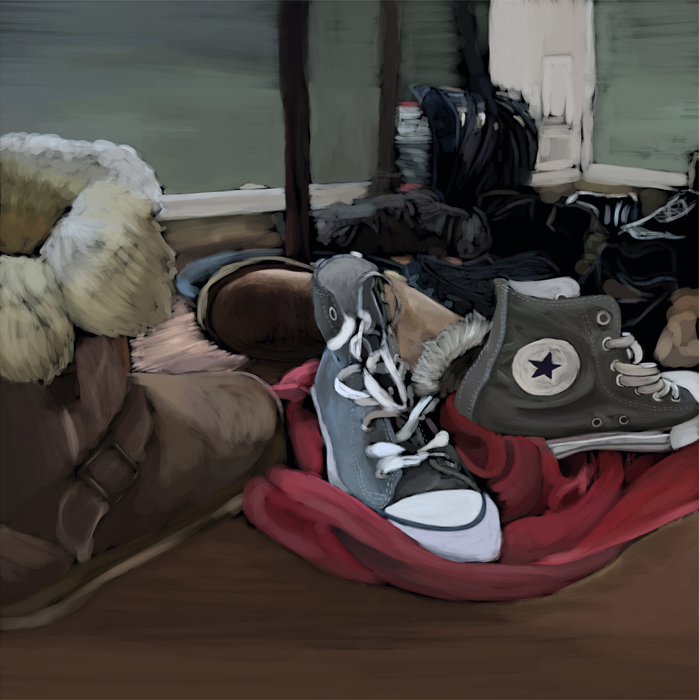 With this piece, I focused on storytelling through the use of shoes. By looking at one's shoes, I begin to imagine what type of life they may lead. In this piece, I explore how shoes can play a key role in defining one's identity. Shoes are a very important part of my own self expression. I use shoes as a way to form my own identity and therefor am careful about which shoes I wear. This project has allowed me to analyze how an image can hold meaning. This image is only part of the story because there is a before and after to every image. How often might this scene change over time? By painting this image I am celebrating and preserving this moment in time. I am painting this environment in order to bring attention to the seemingly mundane and give the viewer the opportunity to see something much greater. This is my early exploration in slit-scanning methods. I created this series based off the notion of a being in search of paradise. Paradise can mean different things for different people. In this triptych, it is simply representative of what one most desires. Chaos and confusion is represented in the first image. The second image, serves as a somewhat calm place of reflection. However, it still has an underlying feeling of unrest. The final image is representative of finding the needle in a hay stack. Finding this paradise seems to be that much more rewarding because of the harrowing journey one goes through to get there. Sometimes a place may not be as safe as it appears. In these paintings I play with the idea of hidden dangers. The danger may not be seen at first, but once seen it changes the meaning or initial mood of the images. Good things may not always be as good as they appear because hey may become the monster lurking in the shadows. There is no why, because that is just how it is. These worlds are dangerous places, especially if one is not aware of the danger. In these worlds, if one is not careful they may fall victim to these monsters that are lurking in the shadows. With these monsters it is not always what you see of them, but what you do not see. The unknown can be terrifying, and often the human mind will try and fill in the blanks. 2016 Willard Wankelman Gallery “Bachelor of Fine Arts Show” Bowling Green, Ohio. USA. In the Summer of 2016, I spent a lot of time reflecting and listening to the world around me. That summer was different in the fact that I would not be attending school in the Fall like I had for the past 4 years. Being finished with school gave me the freedom to work on what I wanted to do without the pressure of getting a good grade. However, it required that I make some serious adjustments to my work ethic. Without having my grades as a motivation, I needed to make sure I had self discipline to continue to improve upon my craft. These images heavily use symbolism to convey key themes in my life at that moment in time. This resourceful octopus spends his days searching the sea for discarded manmade objects. Here he is donning an old diving helmet. This image is commentary on what we are doing to our planet and how the world might adapt. I imagine creatures of the sea using manmade objects as protection; Building homes in the same sense that birds build their nests. As the water level rises, people may become extinct and intelligent creatures like Cephalopods and Dolphins will rule. Artifacts of the old world may be recycled by these creatures while other species will suffer from the garbage mankind will leave behind. 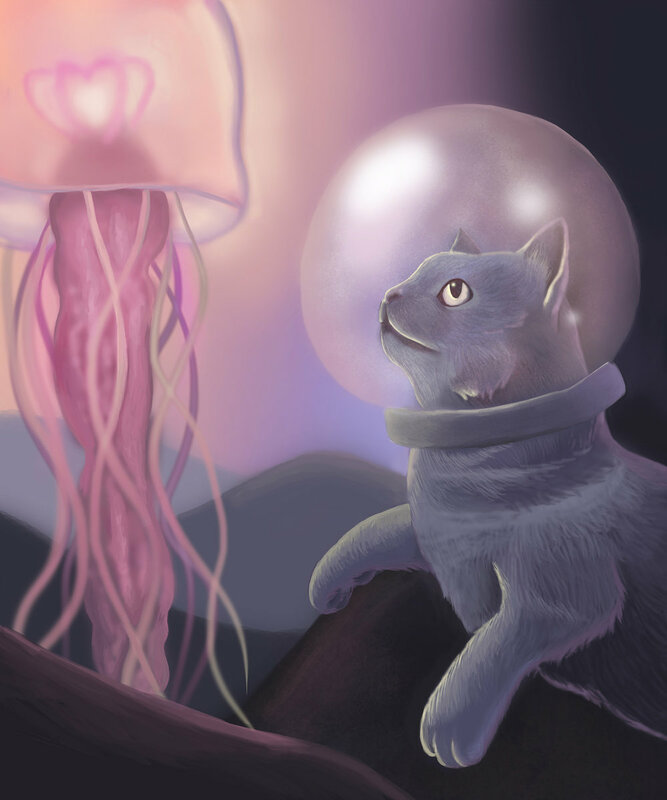 This whimsical image is about a house cat that dreams of life outside its home. It does not fear water, but is intrigued by it. Although seemingly dangerous, curiosity overcomes fear and this cat goes on an adventure well outside a normal feline's comfort zone. 2017 The BG Arts Council “Artists 4 Animals 5” Bowling Green, Ohio. USA.